NORAD’s tradition of tracking Santa on Christmas Eve started in 1955, when a Sears and Roebuck ad promoting the Talk-to-Santa hotline inadvertently sent callers to CONAD (NORAD’s predecessor) commander-in-chief’s operations hotline. After recovering from the surprise that the call was not from the Pentagon or the White House but instead a little boy inquiring if the commander was Santa Claus, Colonel Harry Shoup asked his team to check their radar for signs of Santa’s sleigh and a tradition was born. Follow Santa on Google Maps: Visit www.noradsanta.org to see where Santa is currently flying and where he’s headed next on Google Maps. Click on the video icons to watch “Santa cam” videos from all over the world, and the gift icons will display information about each city along the route. Watch Santa fly in 3D with the Google Earth plug-in: If you have the Google Earth plug-in installed on your computer, you can track Santa’s location in 3D and see him deliver presents everywhere from the mountain villages of the Swiss Alps to the white sand beaches of Hawaii. 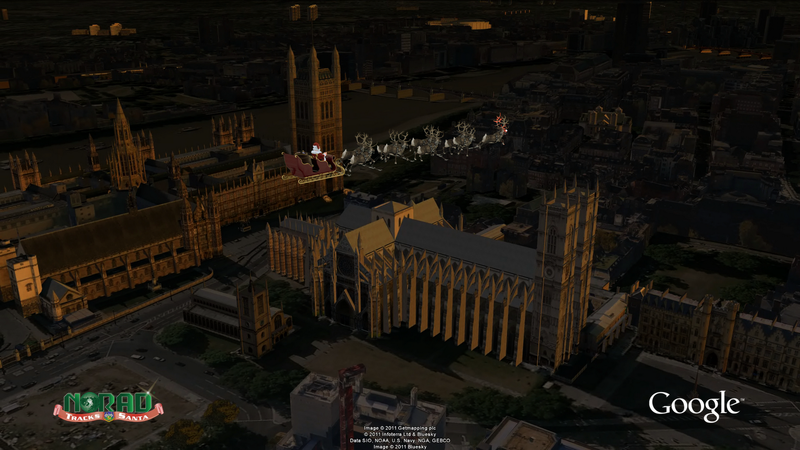 Track Santa from your mobile phone: Follow Santa on the go by searching for [santa] on the Google Maps for mobile app. Get updates via social media: The NORAD team will be posting updates about Santa’s flight throughout the day on December 24. Follow them on Google+, Twitter or Facebook for live updates. Subscribe to the NORAD Tracks Santa YouTube channel: All “Santa cam” videos will be posted on the NORAD Tracks Santa YouTube channel as they’re captured. You can also watch a recap of Santa’s 2010 trip. Check back often for updates! 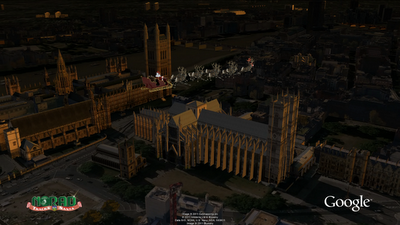 NORAD Tracks Santa is a special project near and dear to all of us involved. I started working on the program seven years ago and it’s been a thrill to watch it grow over the years. Recently, I was given the opportunity to speak at TEDActive about the origins of NORAD Tracks Santa and how Google has brought this to life in Google Earth. I’d like to thank all of Santa’s “elves” that helped out across Google and NORAD far and wide. Happy Holidays!